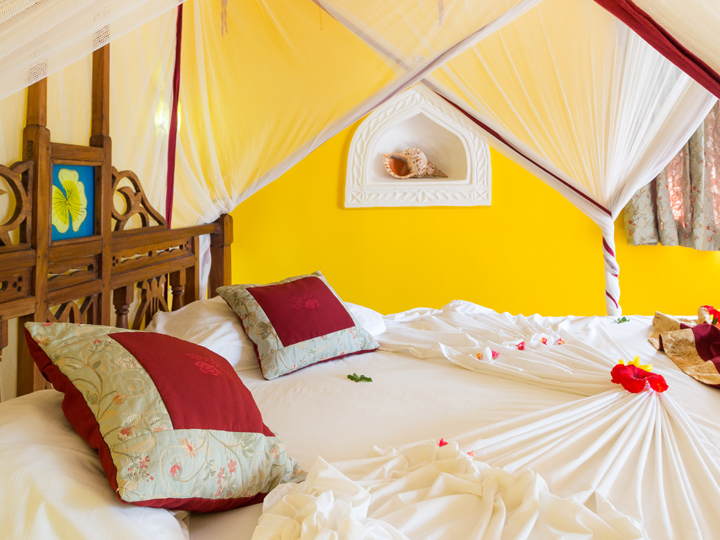 The Waridi Beach Resort has 62 spacious rooms divided into different types: Classic Room, Bungalow, Bungalow Sea View, Family Room and two suites, the Waridi and Sultan. 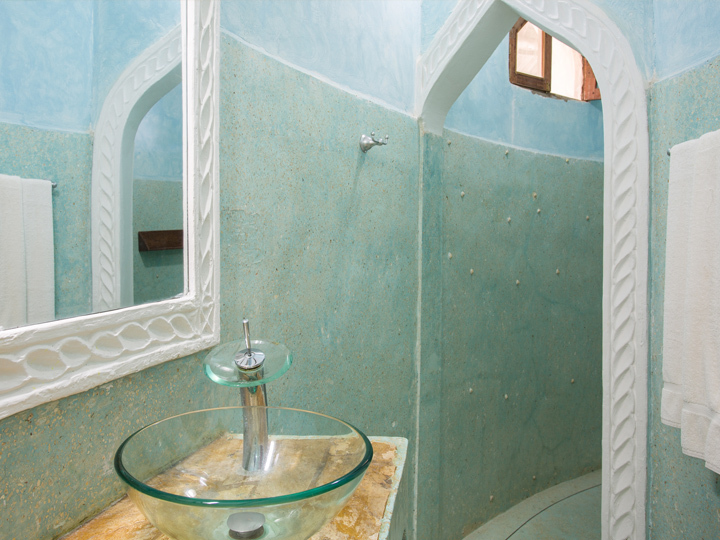 All rooms have air conditioning, ceiling fan, hairdryer, private bathroom, safe, refrigerator and color TV. They can accommodate up to 3 adults. 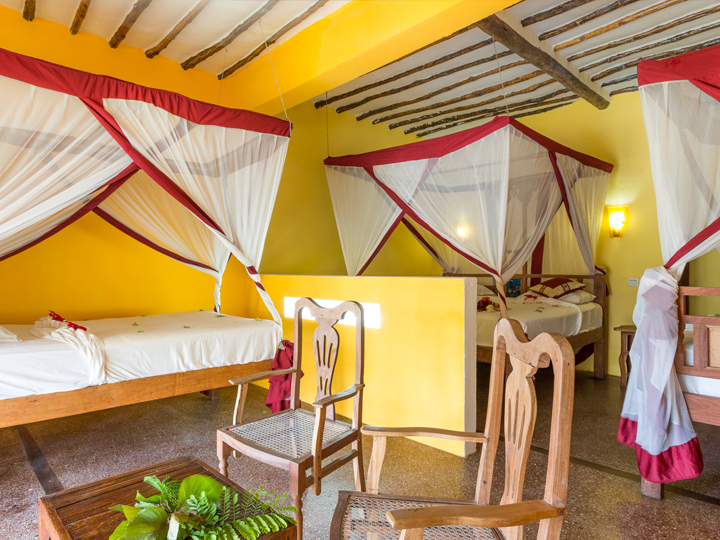 They are located on the first floor of the reception area and situated in an area that is more secluded than the centre of daily and nightly activities of the Resort. They can accommodate up to 2 adults. 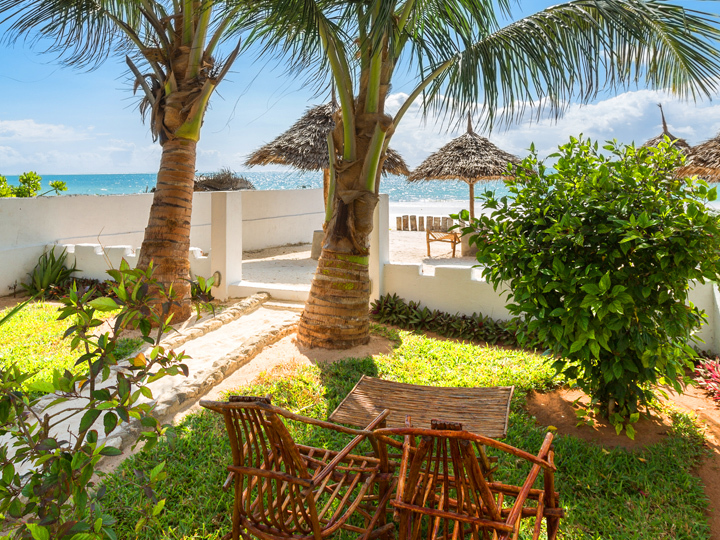 The bungalows are surrounded by tropical gardens and some of these offer great views of the Indian Ocean. All bungalows have the particularity of having floors made of stone "Galana", typical of Tanzania and Kenya, and have a small veranda. The Family Room, ideal to accommodate up to 4 adults or 2 adults and 2 children, are on the second floor of the reception area and have a small veranda. 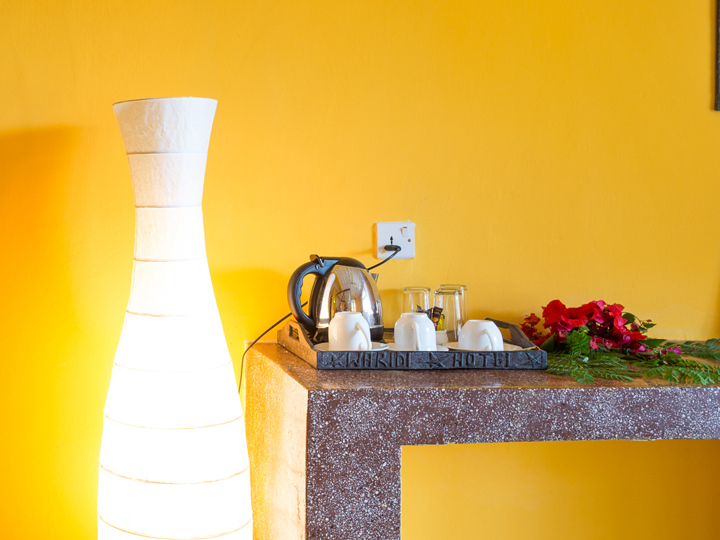 Rooms are very spacious and comfortable, perfect for families. They can accommodate up to 4 adults. 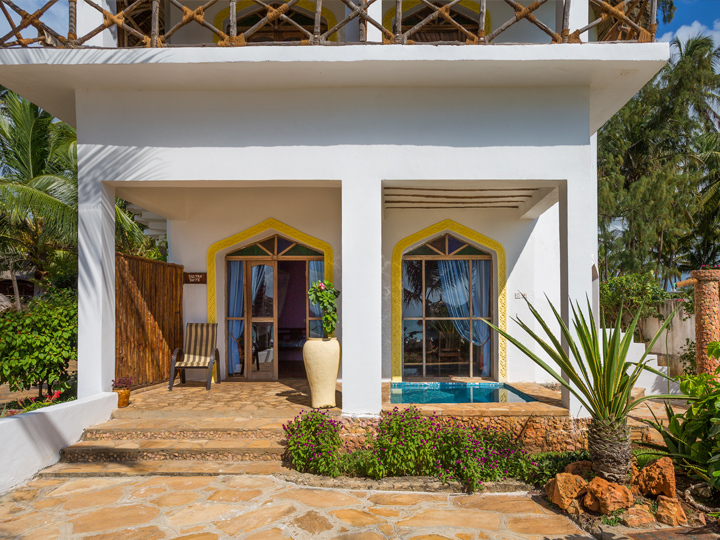 The two Suites have a privileged position with a breathtaking view of the Indian Ocean. They have a shared garden and a private organized beach. 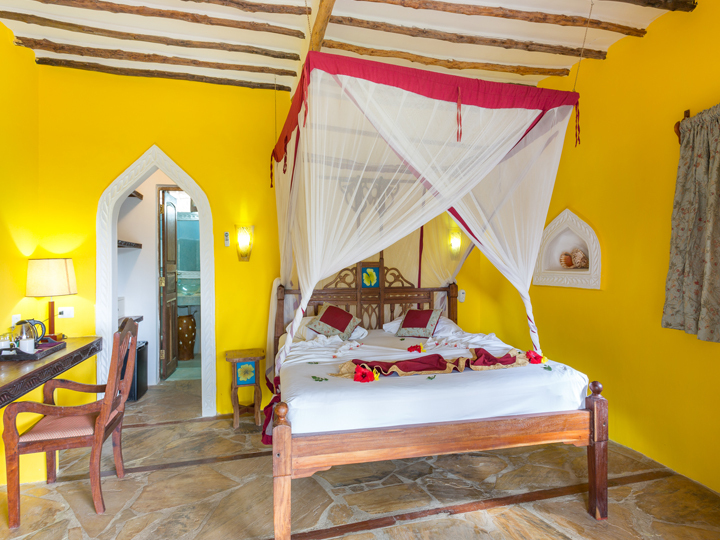 The Sultan Suite, spacious, comfortable and ideal for long stays, is situated on the ground floor and consists of a living area with 2 typical Zanzibar sofa beds, a matrimonial room from which you can enjoy a wonderful view of the ocean, a large bathroom, a small dressing room, veranda/patio with garden access. 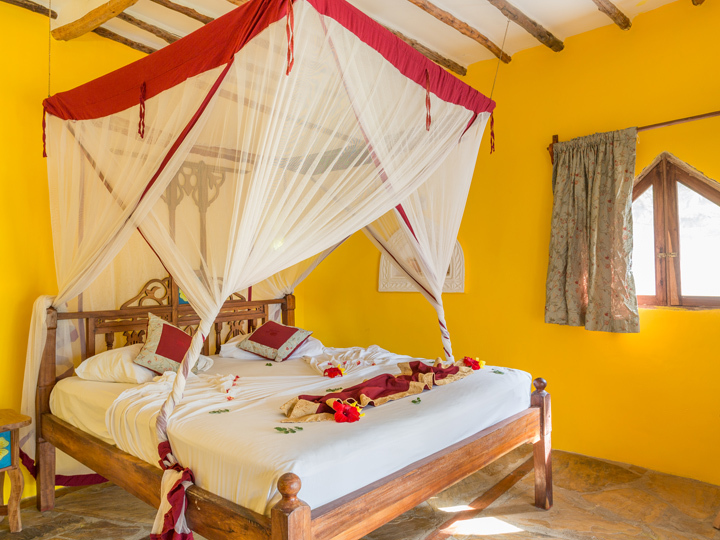 The superlative Waridi Suite is on two floors: at the first floor you can find a matrimonial bedroom, a bathroom and a veranda; at the second floor, reachable from the inside, there is another double bedroom with a particular living area that is only covered by makuti roof (typical of Africa), and a second bathroom.